If you’d like to permanently rid yourself of hair on just one or multiple areas of your body, Denver Laser Solutions offers top of the line laser hair removal solutions. Through the use of intense pulse light (IPL) we can permanently erase unwanted facial and body hair in just a few treatments. What is Intense pulse light permanent hair reduction and how is it different than laser Hair removal? What makes our IPL treatment unique is our ability to achieve excellent results on a wide range of skin and hair colors. IPL is not only FDA approved but it is more comfortable than traditional lasers, electrolysis or waxing. It is the leading edge hair removal treatment that gives our Denver clients lasting and permanent hair removal results. Laser Hair Removal Vs. IPL - What’s the Difference? Mix, match and save - Realize optimal results after 6 treatments! Laser is the source of light used to target and destroy cells that produce hair follicles. Although in Denver it is most commonly referred to as laser hair removal, this technique is FDA cleared as permanent hair reduction. Permanent hair reduction indicates that there may be a few soft, fine stray hair left over after a full series of treatments. Intense pulsed light or IPL is a light beam as opposed to a laser beam, a different modality also used to target and destroy the hair follicles. Here at Denver Laser Solutions we use IPL to achieve permanent hair reduction. Both IPL and laser work similarly by targeting pigment in the hair. The color of your hair attracts the light, converts it to heat, and ultimately destroys the cells responsible for hair growth. The darker and thicker the hair, the larger the target. This hair is most responsive to permanent hair reduction. What are the benefits of IPL over laser? 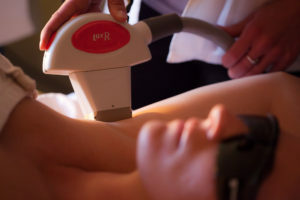 Unlike laser, IPL has the ability to pulse with multiple wavelengths, this allows good treatment of a range of hair types from thin to thick and light to dark. Also, because it is a flash of light and not a collimated beam of light (think of a laser pointer) IPL has the ability to treat a much larger surface area than traditional lasers do. Our IPL platform is water-cooled which means the hand piece tip gets very cold. It acts like an ice pack that sits directly on your skin while warming the hair follicle. This results in a treatment that is skin-friendly and safe. Most people liken the sensation to a warm rubber band snap. The water-cooled tip cools the skin before, during, and after treating the hair. All of which allows for a more comfortable session. You may feel a mild sunburn-like sensation for some time after the laser treatment but this resolves quickly so you can immediately resume daily activities. IPL can only effectively treat hair in the active growth stage, when the hair is still attached to the follicle. Only about 10 to 20 percent of the hair on your body is in the active growth stage at any given time so most people need around six to nine treatments, spaced four to eight weeks apart, depending on the area being treated. IPL is safe for all skin types, from very light to very dark. Since the platform is targeting pigment, it will not work on light blonde (peach fuzz), red, white, or gray hair. There are also other factors in determining the efficacy of permanent hair reduction, including hormones and genetics, which your technician will address during your initial visit. How should I prepare for my laser treatment? We ask our laser hair removal patients to come in shaven and to avoid any waxing or tweezing for three weeks before your appointment. Avoid any prolonged sun exposure both two weeks before and after each treatment, and refrain from using self-tanners. There could be burns or blisters. This is especially a concern with darker skin tones. Our system is developed with a cold tip so it significantly helps reduce the chance of burns or blisters. If the burn or blister is significant it could hyper-pigment dark or light and become permanent. How is your treatment different than at home laser hair removal options? Our IPL technology is much more effective. Most at home devices can temporarily reduce the hair but it does not permanently get rid of it. Is laser hair removal safe or painful for the face? Absolutely. The most common areas we treat for women is on the face. The cold tip on our device protects the skin and makes the treatment more comfortable. You will, however, feel a bit of heat. 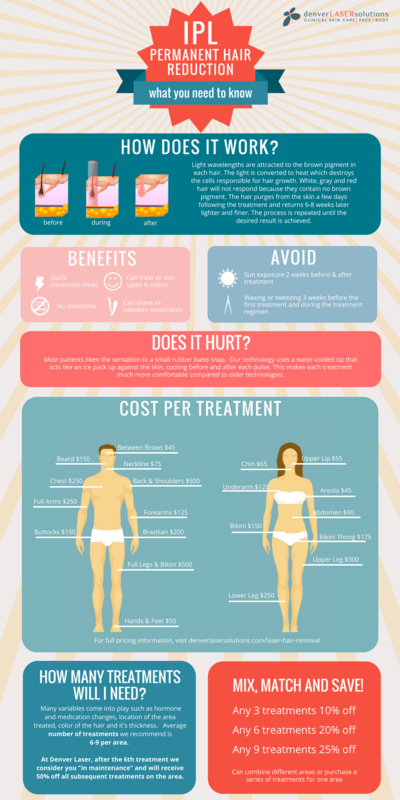 Is laser hair removal painful on your legs? The shins hurt more because the area is boney. Some of our Denver clients also say it can be more sensitive around the ankles. Is laser hair removal more painful than waxing? Our clients consistently tell us that laser hair removal is more comfortable than waxing.